Stand Steady Original Magic Shelf! It has so many uses...it's practically MAGIC! The Magic Shelf has an ingenious design that lets you use it as a lap desk, laptop stand/laptop table, a nest of tables, a standing desk converter/stand up desk, side tables, monitor stand, plant holder, and more! While originally designed as a monitor stand and desk shelf set, we can think of thousands of ways to use the stylish Magic Shelf in your office...or any other space needing functional, flexible furniture! For starters, the magic shelf is great in any room that has a bed or a sofa. And, the magic shelf is so practical and adaptable, it can can add extra work surface and/or storage space in the kitchen - the Magic Shelf is only limited by the imagination! TWO PACK NEST OF TABLES: Your new Magic Shelf is really...magical! With the ability to nest and connect, feel free to twist and turn your nesting shelves/nesting tables however you please! This fabulous feature ensures there are never-ending configurations to this attractive and stylish two-piece desk/shelf set! 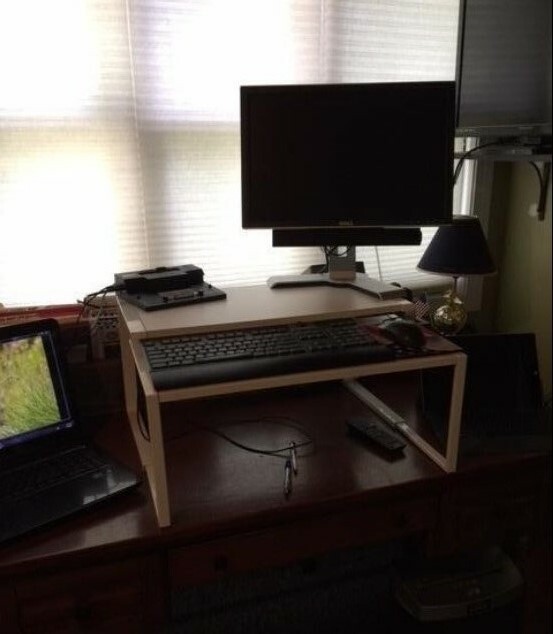 VERSATILE: Is it a stand up desk converter? A pair of monitor stands? A desk shelf? Or a plant holder? YOU decide! Its simplicity makes it the perfect addition to any home, office, or workstation! DID WE MENTION VERSATILE? : The Magic Shelf can really be used in endless ways! It's fantastic as kid’s tv tables, makes a really functional laptop desk, or can even double as a cute side table. The possibilities are truly limitless! EASY TO USE & PORTABLE: Our customer favorite Magic Shelf is extremely lightweight and portable! Whenever you are ready to use it for the next project – simply slide the smaller shelf under the top shelf and take them it their next destination! WEIGHT LIMIT (Larger Table): 25 lbs. WEIGHT LIMIT (Smaller Table): 5 lbs. 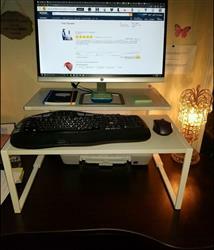 My husband has been wanting a desk riser as he works from home and sitting all day has been hard. 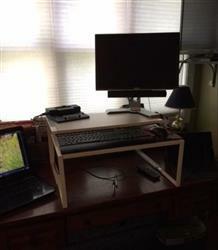 This adapt-a-desk works well and was easy to assemble. He was concerned that it might not be big enough for the laptop and the monitor. Although the picture does not show both on top they do fit well. He is able to stand and do his work. The only downside to this product is that it is not adjustable. So if you want to sit, you will have to move it out of the way. Otherwise a great product and the pricing is good for what you get.